Home / Blog / Yeosu responds to our Friendship City campaigns. 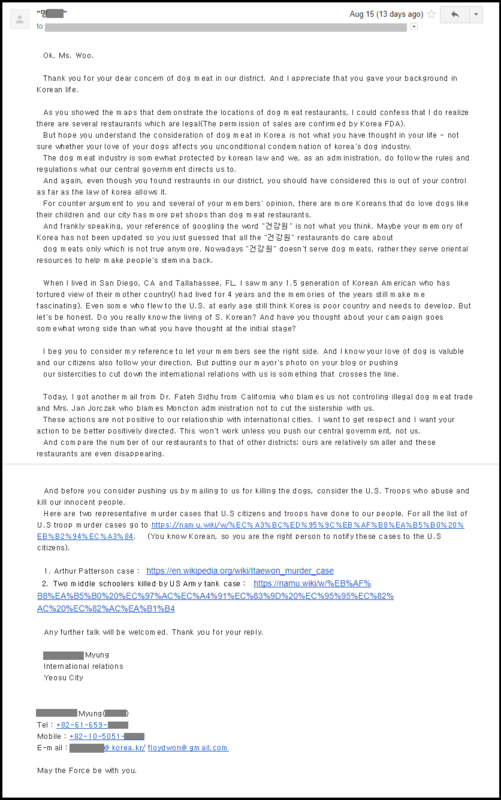 [Update: August 28, 2017] We received another response from the Yeosu International Relations official, Mr. Myung. Below is our response that was sent to Mr. Myung on August 26, 2017. Copies were sent to Yeosu’s Friendship Cities. Thank you for responding to our campaign against the dog and cat meat trade in the city of Yeosu. You stated that the “dog meat industry is somewhat protected by Korean law and we, as an administration, do follow the rules and regulations what our central government directs us to.” Korean laws clearly indicate that the dog meat industry is illegal, so how can you say that you follow the rules and regulations? 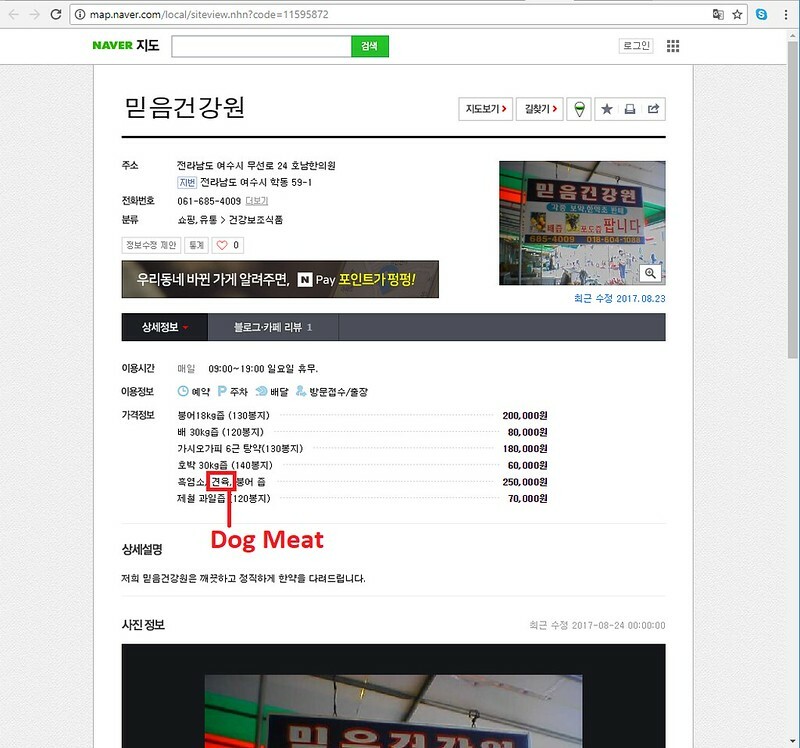 Is what we see in the videos such as this one, https://youtu.be/3uR8R8Mu70Q, from undercover activists, allowed under South Korea’s laws on the dog meat industry? 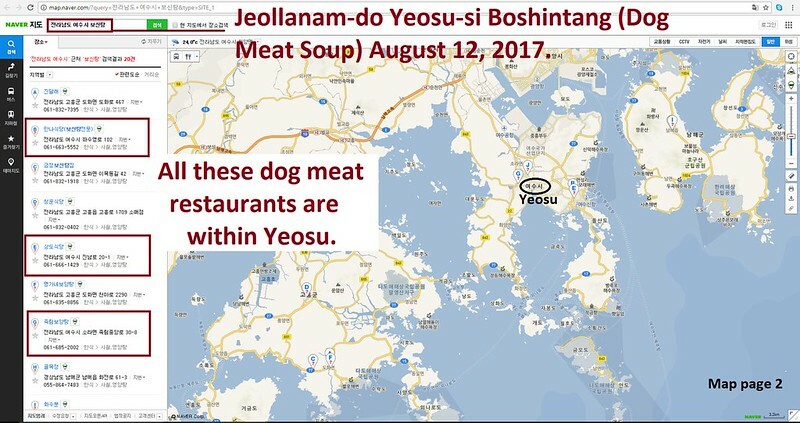 How can the dog loving citizens of Yeosu allow the dog meat industry to cruelly abuse and brutally slaughter dogs? The argument that there are separate “meat dogs” and “pet dogs” is nonsense and is not accepted by the rest of the world. Just because dogs are raised to eat does not make them special “meat dogs” or different from any other kinds of dogs. In any case, all breeds of dogs, including many abandoned former pet dogs, end up being killed by the dog meat industry. 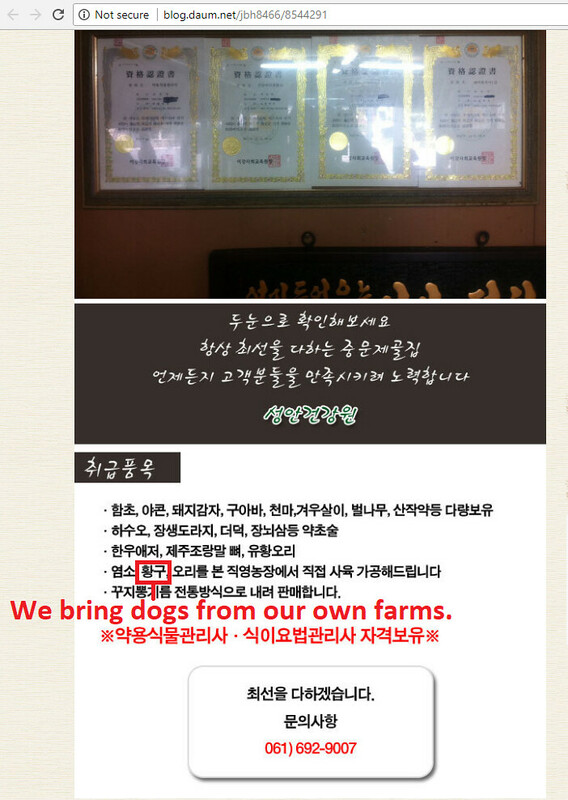 You stated that the Geongangwon (Health Food Shop) ”doesn’t serve dog meats”. But in fact there are Geongangwon that sell dog elixir (dog soju) located throughout Yeosu especially around traditional open air markets. Even if a small percentage of these Geongangwon sell dog/cat products, that could mean a significant number of shops when there are a total of 202 in and around your city. Mr. Myung, our campaign is based on facts and the reality of what is happening in South Korea today. We are campaigning to urge both central and local Korean governments, as well as Korean companies and other organizations that have relationships with Korea, to shut down the dog meat industry. While I do understand that this issue is not easy to resolve, neglecting what you can and must do means that nothing will change and that millions of dogs and cats will continue to suffer and die every year. 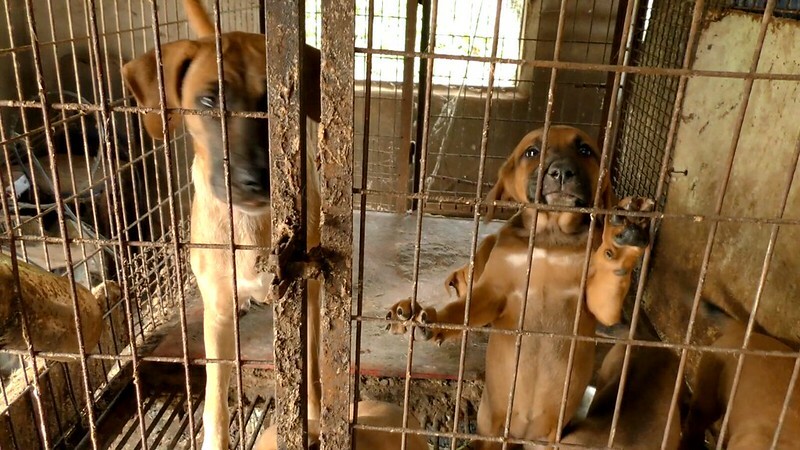 If the Korean government continues to neglect its duty of enforcing laws to protect the animals and fails to show moral leadership for Korean society, then Korea will continue to be the target of condemnation and criticism. So I urge you to please deliver our message to your mayor and for your government to start enforcing the laws seriously and properly to end the dog meat industry. Below is another response we received from Mr. Myung on August 28, 2017. Click HERE for the link Mr. Myung shared on his email. Click HERE for English translation (caption). 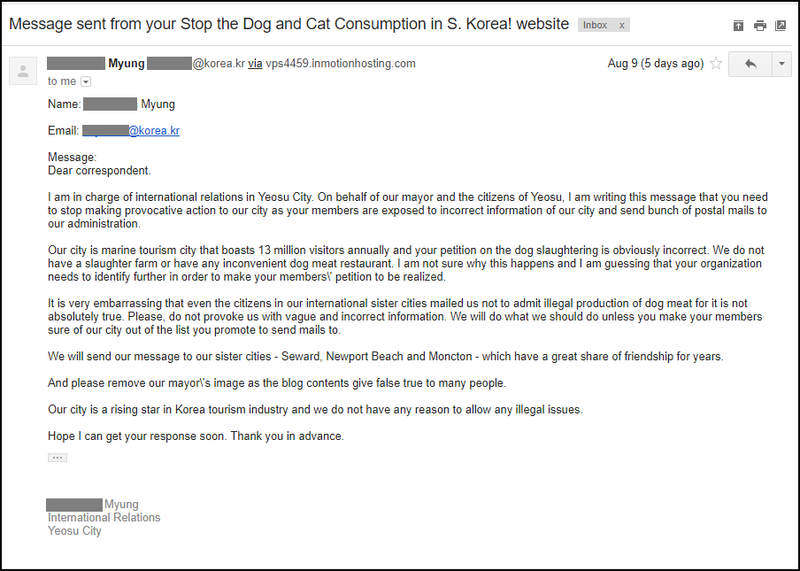 We received an email from an International Relations representative from Yeosu regarding our three Friendship City campaigns urging Yeosu’s Friendship Cities to speak out against the cruel and illegal dog meat industry in Yeosu. Click HERE for Friendship City Campaign – Yeosu, South Korea – Moncton, New Brunswick, Canada. Click HERE for Friendship City Campaign – Yeosu, South Korea – Seward, Alaska. Click HERE for Friendship City Campaign – Yeosu, South Korea – Newport Beach, California. Below is our response that was sent to Mr. Myung. Copies were sent to Yeosu’s Friendship Cities. Our campaigns are based on facts and honest research. 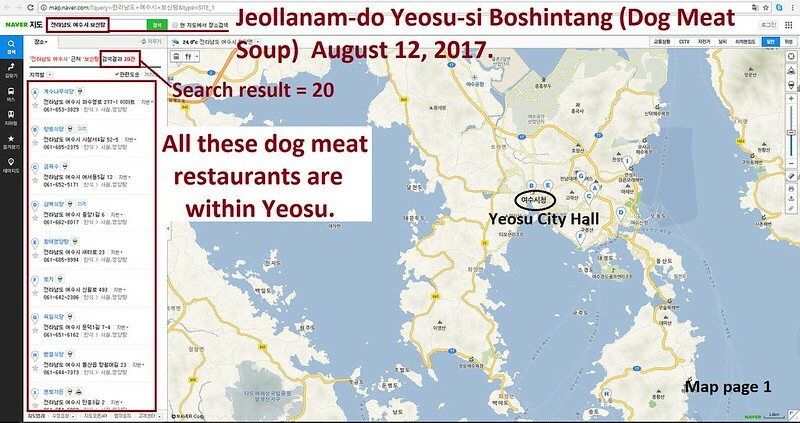 We have found that the illegal dog meat industry does indeed exist in Yeosu and your city appears to be doing nothing about it. 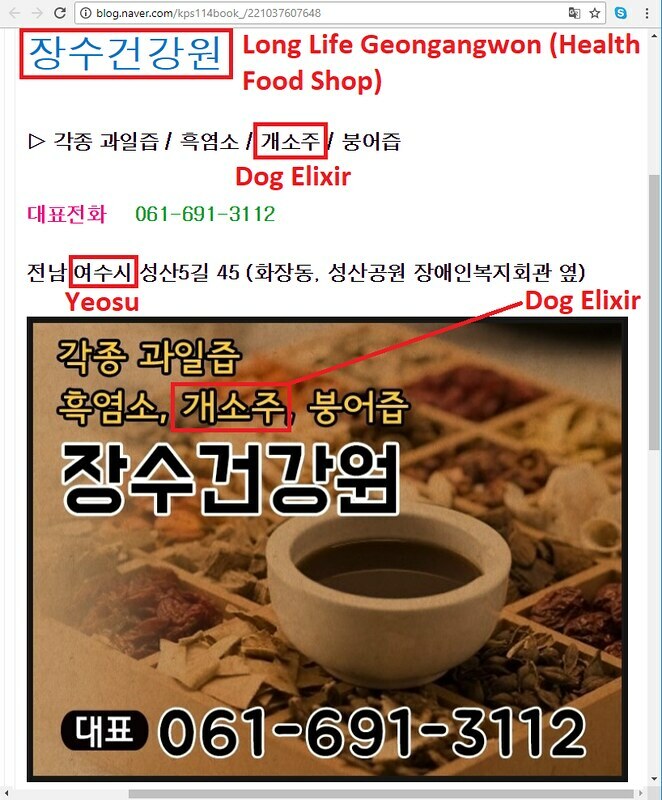 Therefore, all the restaurants in Yeosu that sell dog meat/elixir products are operating illegally. What is Yeosu doing to enforce the law and shut down these illegal businesses? Mr. Myung, I grew up in Korea, and I’m fluent in Korean and very familiar with Korea’s dog meat industry. No one has challenged the Korean government regarding this illegal and cruel industry the way we are doing with the Sister/Friendship City campaigns because people do not want to upset Koreans. We have no choice but to continue our campaign because the Korean government will not take steps to end this horrific and illegal industry. The solution is not to ignore the problem, deny the problem, or hide the problem (such as insisting Mayor Ju Cheol-Hyeon’s photo be taken off our campaign page). The solution is to fix the problem by ending the illegal dog and cat meat industry permanently. Ginny, this is an excellent, extremely provocative response. I hope the sister cities will realize the reality of dealing with the local government of South Korea. Thank you for your hard work! THE KOREANS WILL CONTINUE TO DENY SUCH EVIL/DEMONIC THING THE ARE DOING TO DOGS/CATS—SO AS TO KEEP 13 MILLION VISITORS COMING—TOURISTS/VISITORS STOP SPENDING MONEY IN KOREA–INSTEAD SUPPORT CRUELTY AGAINST DOG/CAT MEAT TRADE IN ALL ASIAN COUNTRIES AND SOUTH KOREA— ALSO HELP WIT HUMANE SOCIETY INTERNATIONAL TO BUILD SHELTERS/PROVIDE FOOD/ADOPTIONS OF DOGS AND CATS THAT ARE CONFISCATED FROM DOG FARMS—-VISIT WHEN THIS COUNTRY IS CLEAN OF DOG/CAT MEAT TRADE AND END ALL CRUELTY TO ALL ANIMALS. I am in agreeement with your response as posted. This horrific and tormentous action is unbearable and heartbreaking. I will continue to support the permanent end of the illegal dog (and cat) meat trade. These beautiful animals were not put on this earth to be consumed ……I cannot accept this horrible action. Very good response, well done,lets keep going ! It’s a pity that people from all around the world keep visiting countries were dogs and cats are eaten. Perhaps, if people stopps going there, they do something about this matter. Good point. Boycott is essential. Thank you Ginny Woo for speaking with our united voice. Excellent. You are really rattling them with your brilliant campaign. Well done. I will keep signing every petition until this ends. Very well answered Giny !! I wonder why the new president of South Korea, Mr MOON, does nothing? I was so happy when he was elected !!! More than when the president in France was elected !!! I put a lot of hope in him to completely forbid this horrible trade !! Thank you for your kindness and hard work Ginny Woo. Thank God you have first-hand knowledge about Korea. Otherwise they could have conviced people. Seongwon Myung, I’ve read your responce and I don’t believe you! Stop lying! Your city is not “a rising tourism star”, it is one of the cities which are the reason we boycott SOuth Korea as a whole! Stop pretending you’re a blind idiot. Well said Ginni!! thank you for your efforts! !, Good luck!! You are an extraordinary woman Giny Woo! God will bless you, and is blessing you, for being a voice for those who have no voice. I stand up and salute you for not backing down to this stupid barbaric response from this so called human being. He and those like him should be thoroughly ashamed of themselves but…sad to say these people do not have feelings other than those between their legs. I beet a dollar to a dime that yet again its money,drugs and corruption that is behind all of this. What else should we expect from such sub-humans as these. SHAME ON THEM. I really hope with all my heart and soul that you can turn his heart …if he has one…. these poor dogs and cats need someone to care about them. Our tears dont do any good…but I have shed too many of them. I want to march over there and take these idiots to these farms (that they know exist) lock them up and then do the same to them and serve them up on a plate….then the cats and dogs can eat them. Sounds terrible doesnt it….NO….’cos this is what the animals are going through. Well said Catherine, can I come with you and be your henchman. CATHERINE AND JUNE, WELL SAID!!!!!!!!!!!!!!!!!!!!!!!!!! How I so agree with you Catherine!! I too have cried so much, useless though that is! I sign – I write – I e-mail – I telephone!! Not enough I know! But what I DO know is that I never in my whole life realised how strong my hatred is for this evil, barbaric scum & how I wish that the same would happen to them – Only one hundred times over!!! May they all rot in hell!!! And for what it’s worth President Moon should rot in hell too alongside his corrupt predecessor Parc!! I see a profound indifference too from the civilised world EU, USA, CANADA and AUSTRALIA especially from the governments which implies total complicity. Excellent and thank you Giny Woo! Their reply is so utterly negative and uninformed. Great job Ginny. So proud that you stand up to these vile lies and that you are a strong, truthful voice for these innocent, defenceless animals. His response to your sending this very important petition is absolutely despicable. Enormous thank you Ginny Woo. To deny it is to turn a blind eye to the shocking horrific barbarity. This outrageous cruelty can no longer be hidden thanks to the Internet the information gets around the world in seconds. The world is watching and getting impatient….the IOC are being bombarded with mail to boycott South Korea Winter Olympics. They must know that they have dog meat restaurants, and just want to cover. Yes it is embarrassing, sick, and they can loose visitors. I know I will never go there. Ginny, great work you have done!!!!! Well done Ginny, I hope these people will feel ashamed of themselves for the lies they tell. You have shown them for what they are cruel,barbaric torturers of sentient companion animals who won’t even admit this abhorrent trade exists. This is so right-on! Government turns a blind eye because awareness makes them have to act. I will NEVER visit Yeosu, even though I visit Korean often due to my relatives. I try not to go to Korea b/c of the dog meat trade and encourage my relatives to instead, visit me. Keep up the great campaigning and have Korean own their mistakes and lies. Your reply was truly remarkable! Well done! The fact that they deny the existence of the dog meat trade surely proves that they know how repulsed people are by it!!! What a brilliant response! Ginny Woo I love you,thank you for everything that you are doing to help these poor animals! GINY WOO EXCELENTE RESPUESTA!!!!!! DE VERDAD GRACIAS POR SU LUCHA POR LA LIBERACIÓN DE ESTOS INCREÍBLES PERROS Y GATOS. MILLONES DE PERSONAS ESTAMOS UNIDAS A LA LUCHA POR ACABAR ESTOS CRÍMENES EN SERIE ALREDEDOR DE ASIA. Y NO PODEMOS SEGUIR TOLERANDO ESA ATROZ CRUELDAD!!!!! GRACIAS POR SU VALOR, POR SU PERSEVERANCIA Y SU DURO TRABAJO!!!! GRACIAS GINY WOO!!!!!!! These called humans are trying to persuade us that this trade does not exists in their city. We are not foolish. We need to keep fighting for these defenceless animals. BRAVO Giny! You told to that corrupt liar the teallity of that city and the animal abusers, who are trying to fool everybody about their sadistic and abusive treatment to thousands of defenseless and innocent dogs.That is a curruptured and very embarrassing person, clearly they are training to cover the truth about their evil and macabre way they kill dogs, it is embarrassing and YOU Myung are a shame and embarrassment to the good people who love and respect animals in your country. Giny you are a heroe and thank you for putting that Liar in his/her place, the wall of shame. Ginny Woo: Your reply is accurate, full of facts/references. We are all continuing to be behind you. Thank you for your hard work. Please keep us updated. THANK YOU, Ginny Woo, for all the hard work that you are doing to stop this TERRIBLE, HORRENDOUS, UNCONSCIONABLE, INHUMANE “business” in Korea! No one will do anything to stop this despicable trade until all the “Friendship” cities know exactly what is going on in Korea! Thank you for all you do. Your letter was direct, resourceful and very professional. Keep up the great work as you have many supporters. Very good rebuttal, Giny — you put up a good defense — it appears Mr. Myung is nervous & agitated — if only Mr. Myung would SHUT DOWN these hell-holes, though — it would be great if you or your rep would personally visit Mr. Myung & get some face time — you may even lead him to some of those actual meat farms so he can finally face the truth — stop turning a blind eye to this horror & continue with his lies — enough pressure should force him to face this brutal business & have them PERMANENTLY CLOSED & BANNED! — He just may force these hell-holes to SHUT if tourism is threatened. I am starting to think that Kim Jong-un is right about South Korea. Fantastic response to this persons complete and utter lies – well done you. I am very glad that you are on our side. Thank you, Ginny, for refusing to back down concerning this horrendous dog meat trade. You are doing a stupendous job! Very good response, well done! BRILLIANT RESPONSE GINY, KEEP THE PRESSURE ON THEM, WE’RE ALL BEHIND YOU. As always, well done Giny!! Keep up the pressure! We all support you. Great strides are being made. Since animals cannot speak, we are their voices!!!!! wow, first they say dog meat trade soesn’t exist, now they say it’s legal. This is as stupid as Russians pretending there are no Russian troops in Ukraine. And the same stupid “America kills people, so shut up”. No, dear Seongwon Myung, this is YOU who crossed the line. You are an official and you lie. And we will continue telling each and every person your city is a place of horror and hypocrisy. Well done Ginny, Mr Myung is clearly rattled because you come back with facts. Keep at him. Absolutely,Pamela! Giny, you are fantastic , your letters tell it like it is! I’m so disappointed but so must you be yet you fight on and inspire us to keep fighting. I have written hundreds of letters, like so many people. Mr Myung is a liar, very economical with the truth, that is if he knows the truth. He is a great disappointment and his high flyers with him. This is a mindless, trodden down, uneducated and backward country which has no interest in doing anything about it. Rotten leaders of rotten peasants. A well explained reply, thank you Ginny so much. We continue the fight for as long as it takes for the animals! Classical rigid language of the S. Korean state bureaucratic mechanism, distinguished by cheap arguments, contradictions, lies and hypocrisies. Ginny, I’m trying to find a way to contact you. If you can, shoot me an email. I am greatly disturbed by some of these responses attacking our military. I served under USFK and have sent the link to the Commander over in the Army Garrison in Seoul. The Korean Army knows many of the government officials in each district. I look forward in hearing from you.